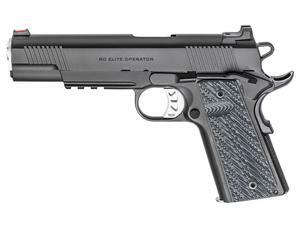 The Springfield RO Elite features premium upgrades in the popular 10mm caliber, suited for competition, hunting or personal defense. Features a 5" forged match grade barrel, forged steel slide and frame with a corrosion resistant Black-T finish. The forged steel frame and slide sets this 1911 apart from cast models by offering strength and durability. A fiber optic front and rear tactical rack sight offers fast sight acquisition.